​​​​Daniel L. Klopotek, 56, of Shabbona, loving husband and father, went home to be with his LORD and Savior on Tuesday, October 17, 2017. 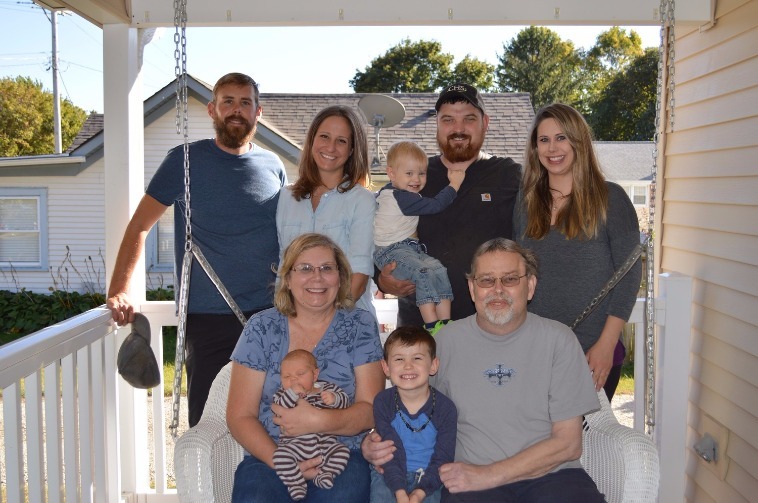 After a long and courageous battle with ocular melanoma, Dan passed peacefully surrounded by his loving family. Born August 3, 1961, in Elgin, Illinois, beloved son of Floren and Beverly (Oberg) Klopotek, Dan married Kristine Houghtby on May 12, 1984 in Shabbona, IL, where they have made their home and raised their family for the past 33 years. He graduated from Kaneland High School in 1979 and went on to pursue a career in automotive mechanics. From 1993 to 2012, Dan served as service department manager at Mike Mooney Chevrolet-Cadillac in DeKalb, IL. During the past 5 1/2 years, Dan has worked for the Indian Creek School District as Maintenance Director. Whether at home or work, Dan enjoyed the challenge of fixing things and had a tremendous gift for figuring out how to do so. 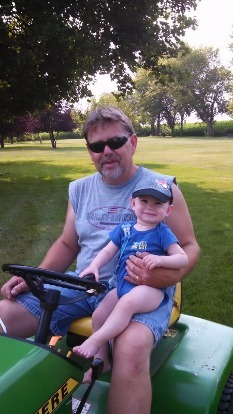 Dan's greatest joy came from spending time with and taking care of family and friends. 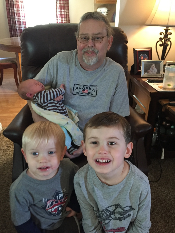 Of all Dan's accomplishments, he takes the most pride in his children and grandsons. 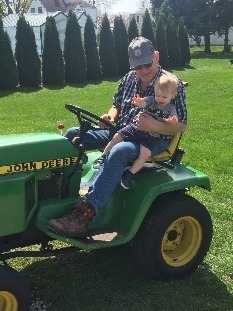 He loved getting down on the floor to play with Liam and Landon, taking them for rides on the John Deere and working on little projects together. His face lit up when he was able to hold his newest grandson, Lukas, for the very first time two weeks before passing. Dan enjoyed the simple pleasures of family gatherings, sitting by a campfire, working around the yard, and joking around in good fun. He had a wonderful sense of humor and a positive outlook on life. His smile and laugh were contagious. Although Dan's time on this earth was much too short, he lived it well. He always put others before himself and strived to serve God by serving others. Dan's strong faith and hope in God's will for his life were an inspiration to all who knew him. Dan will be greatly missed, but forever in our hearts. Dan is survived by his wife, Kristine of Shabbona; son, Jeff (Sarah) Klopotek of Rochelle; and daughter, Beth (Anthony) Dewitz of DeKalb; grandsons, Liam, Landon and Lukas Dewitz; mother, Beverly (Pat) Fenelon of Shawano, WI; sister, Debi (Steve)Rasmussen of Watertown, WI; in-laws, Charles and Joan Houghtby (Dekalb), Susan (Stan) Kapraun of Roanoke, IL and Jennifer (Joe) Masini of Mendota, IL; as well as numerous cousins, nieces, nephews, aunts, uncles and friends. He was preceded in death by his father, Floren Klopotek; and grandparents, Willard and Ailie Oberg, and Carland Minnie Klopotek. Visitation and a celebration of life for Dan have been completed. The family wishes to thank Dan's wonderful team of doctors, nurses and caregivers: H Culver Boldt, MD and Yousef N. Zakharia, MD (University of Iowa Hospitals and Clinics), Sabet Siddiqui, MD and Jamie Gibson, APN (Oncology MDs, Dekalb, IL), and Heartland Hospice (Rockford, IL). 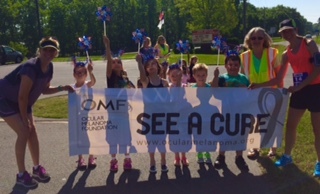 In lieu of flowers, the family has requested that donations be made to the Ocular Melanoma Foundation to help find a cure. Ocular Melanoma is a rare disease. Therefore funding for research to find a cure is very limited at this time. Contributions can be sent to the Ocular Melanoma Foundation at 1717 K St. NW, Suite #900, Washington DC 20006 or by clicking on the blue donate button to your upper right.